An estimated 59 million people living in the US suffer from thyroid problems, and the worst part is that many of them do not know they have thyroid issues. 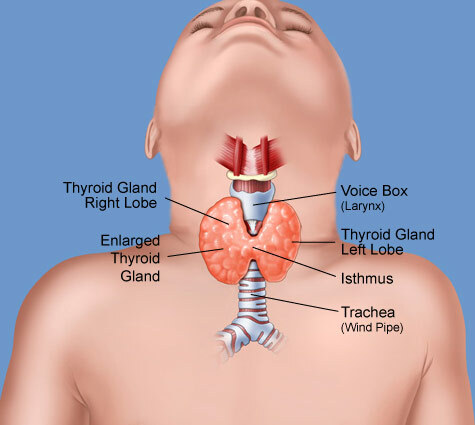 The thyroid is a gland located at the neck and has a butterfly shape. When the thyroid fails to function, every aspect of a person’s life is affected especially the weight, energy and depression levels. Having thyroid problems, which go undiagnosed, can dramatically affect a person in that they have increased chances of suffering from heart disease, obesity, anxiety, depression, sexual dysfunction, infertility and hair loss among other symptoms. Below are some common signs of thyroid problems. However, you do not have to have all the mentioned symptoms for you to know that you suffer from thyroid problems. When there is production of excess thyroid hormone in the thyroid, the thyroid becomes overactive.This condition is referred to as hyperthyroidism. Having hyperthyroidism means that all the major systems in the body are in overdrive, and this can result in several unpleasant symptoms ranging from anxiety to diarrhea. If the overactive thyroid goes untreated, it can eventually cause a fatal condition known as congestive heart failure. When the thyroid starts producing very little thyroid hormone, it is considered to be underactive.This condition is referred to as hypothyroidism. In hypothyroidism, the major systems in the body function slowly resulting in different symptoms, which range from depression to weight gain. Below are common symptoms of thyroid dysfunction. Undiagnosed thyroid problems have been known to cause joints and muscle pain and aches. What’s more, your hands/arms can also develop carpal tunnel. The legs can develop tarsal tunnel and the feet can develop plantar fasciitis. Thyroid disease can also be characterized by an uncomfortable neck swelling, discomfort with neckties or turtlenecks, a visibly enlarged thyroid (signs of goiter) or a hoarse voice. Skin and hair are most vulnerable to thyroid problems more particularly loss of hair. With hypothyroidism, the hair regularly becomes dry, coarse and brittle and also falls out and breaks off easily. The skin can also become scaly, dry, thick and coarse.With hyperthyroidism, a person may experience severe hair loss and the skin becomes thin and fragile. With hypothyroidism, long-term or severe constipation is experienced while hyperthyroidism is associated with IBS (irritable bowel syndrome) or diarrhea. Hypothyroidism is associated with more painful and frequent periods whereas hyperthyroidism is associated with infrequent, lighter or shorter menstruation. Undiagnosed thyroid problems have also been associated with infertility. If you notice changes in your menstrual cycle (bleeding levels, cycle length and cycle frequency), contact your physician for thyroid evaluation. When thyroid hormone production is low, metabolism is slow, and this eventually impairs your body’s ability to process cholesterol. High cholesterol levels (especially when the levels do not respond to diet, taking medication or exercise) can be as a result of undiagnosed hypothyroidism. On the other hand, having cholesterol levels that are unusually low could be a sign of hyperthyroidism. Anxiety or depression, which includes the onset of sudden panic disorder, can be symptoms of undiagnosed thyroid disease. Depression is associated with hypothyroidism while panic attacks and anxiety are associated with hyperthyroidism. Depression that fails to respond to medications like antidepressants can also be a sign of undiagnosed thyroid disorder.The thyroid society states that most patients diagnosed with hypothyroidism have a certain level of related depression. You are on a low calorie, low fat diet and still finding it hard to keep off that extra weight? Or are you in a support group like weight watchers and still find it difficult to lose weight? This could be a sign that you have hypothyroidism. On the other hand, if you eat the same amount of food and are still losing weight, this could be a sign that you have hyperthyroidism. If you have been feeling exhausted whenever you wake up, or you find it hard to function throughout the day without a nap in between, it could be a sign that you suffer from thyroid problems. With hyperthyroidism, you may find it hard to sleep at night (nighttime insomnia) which ends up leaving you exhausted during daytime. Feeling cold: Conversely, those who have an under-functioning thyroid may constantly feel cold. Heat intolerance: People whose thyroid gland is overactive often find it hard and uncomfortable staying in places that have high temperatures. The symptoms for hyperthyroidism include weight loss even when you have an increased appetite, increased heart rate, high blood pressure, excessive perspiration, nervousness, heart palpitations, frequent bowel movements and at times with diarrhea, trembling hands, muscle weakness, goiter development, shorter or lighter menstrual periods. The symptoms for hypothyroidism include depression, slow mental processing, lethargy, reduced heart rate, oversensitivity to cold, numbness or tingling in the hands, goiter development, heavy menstrual cycle, constipation, dry hair and skin. The symptoms include severe or mild pain in the thyroid gland, tender thyroid gland, discomfort or pain when turning your head or swallowing, appearance of the aforementioned symptoms soon after a viral infection like measles, mumps or flu. Symptoms include difficulty swallowing, feeling full, pressure or pain in the neck, hoarse voice, neck tenderness. Symptoms include lump in neck, difficulty swallowing or breathing, voice changes, swelling of the lymph node. You are delirious, agitated or feverish, and your pulse is rapid because there is a possibility that you are undergoing a thyrotoxic crisis, an abrupt and dangerous hyperthyroidism complication. You are intensely drowsy, lethargic and cold. There is a possibility that you are experiencing a myxedema coma, a sudden and dangerous hypothyroidism complication that causes unconsciousness and even death.